2015 Iron Dog Team 4 is ready to race! All of the preparations and tech inspections are finished. Now rookie riders, Kidwell and Wood just need to reach the the finish line. 2015 Iron Dog Team 4 drew the fourteenth starting position for the ceremonial start, Saturday February 21, 2015 in Downtown Anchorage. Alaska Foot & Ankle Specialists is the top sponsor for 2015 Iron Dog Team 4. The Iron Dog snowmobile race is 2,000+ difficult Alaska miles and has earned its title as the world’s longest and toughest snowmobile race. 2015 Iron Dog Team 4 will navigate through rugged terrain, fierce weather, unforgiving wilderness, deep snow, snowless stretches and extreme subzero temperatures. 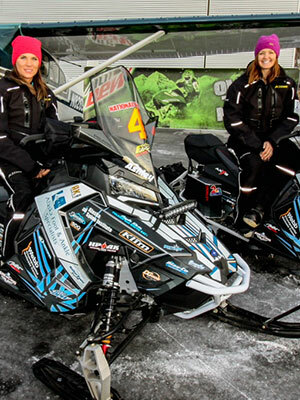 The last all-female team that entered the Iron Dog was in 2010 and the only all-female team to finish the race was in 2000. Good luck 2015 Iron Dog Team 4!